I left off as we were on our way out of Sultanahmet, and on our way to Beyoglu. It was still pretty early in the day – 10, 10:30? 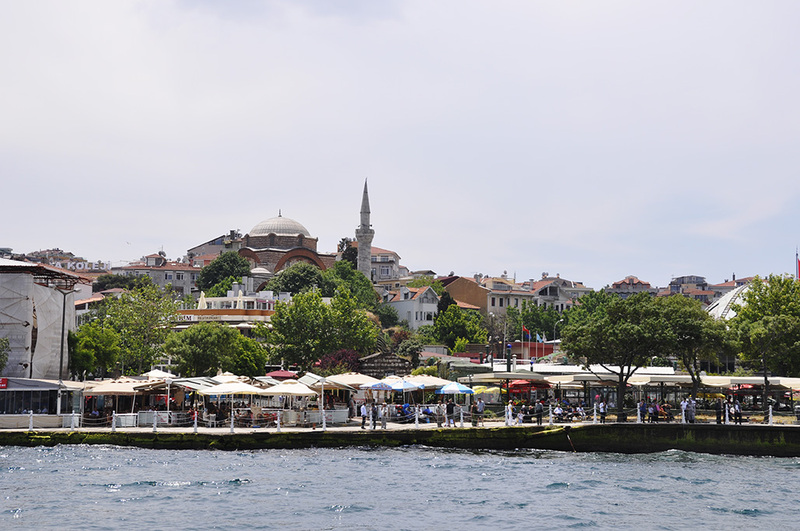 – and figured we had plenty of time to metro over to our next hotel in Beyoglu, and then head back out to catch some ferries for a timely lunch in Ortakoy. 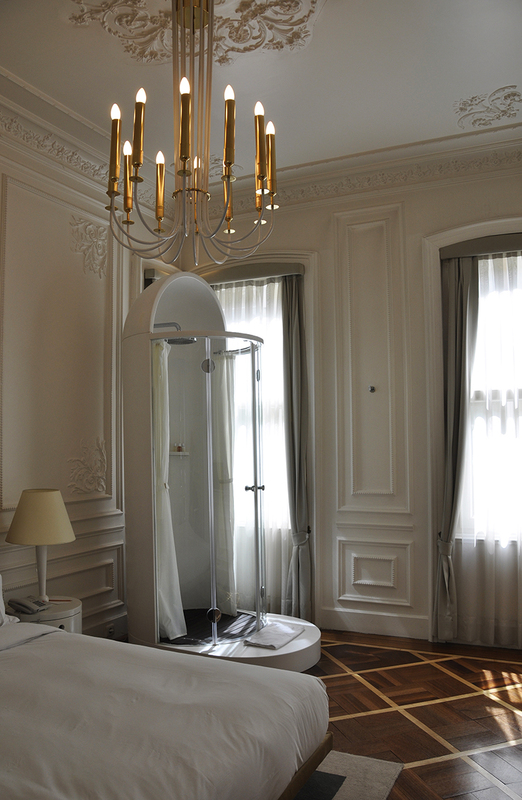 Thankfully, the hotel – The House Hotel Galatasaray – was able to check us in nice and early and with an upgrade t’boot. I had initially tried booking the penthouse suite, but there was no vacancy, so they offered me their best suite – the executive suite – at the penthouse’s cost. I was still a bit disappointed because I am a sucker for open-plan living spaces and exposed beam ceilings, but the upgrade was still pretty nice! 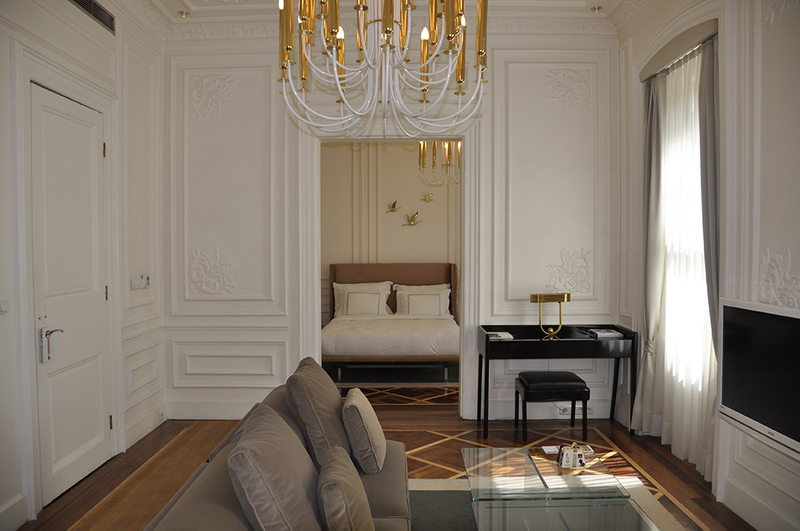 I loved the ornate moulding details on the ultra-white walls and ceiling, which normally wouldn’t be my style but after my stay there I think I would rather like a room in my home to be similarly styled. The hotel also featured a lovely rooftop lounge with fantastic views over Beyoglu and of the Galata Tower and even the Blue Mosque and Hagia Sophia across the Golden Horn. Added bonus? The best breakfast we had in Istanbul. 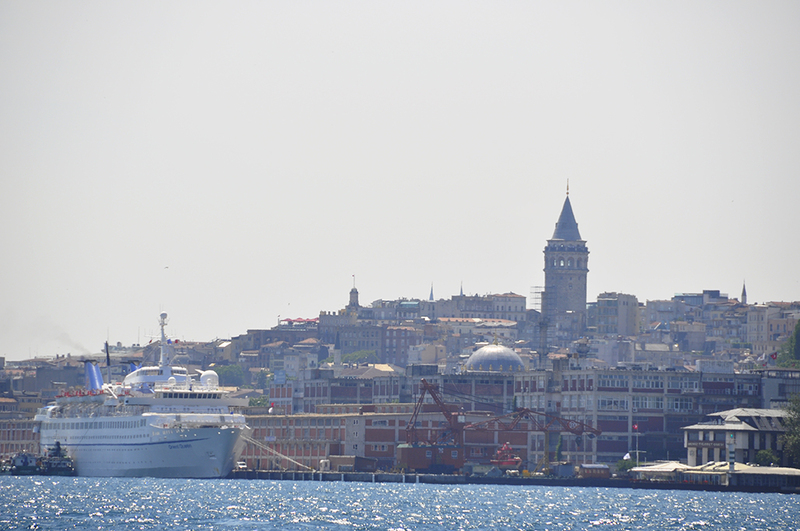 Ever thinking of the next meal, we quickly headed back out to start catching some ferries to have lunch in Ortakoy. This would prove to be a confusing, frustrating and seemingly endless journey. We first tried to catch the ferry at Karakoy (Beyoglu), where we missed boarding by a fraction of a second. Instead of waiting for 12 minutes or whatever it was for the next ferry, we made our way across the bridge to Eminonu (Sultanahmet) where thankfully, we just made it on to a ferry bound for Uskudar, which is located on the Asian side of Istanbul. OK. 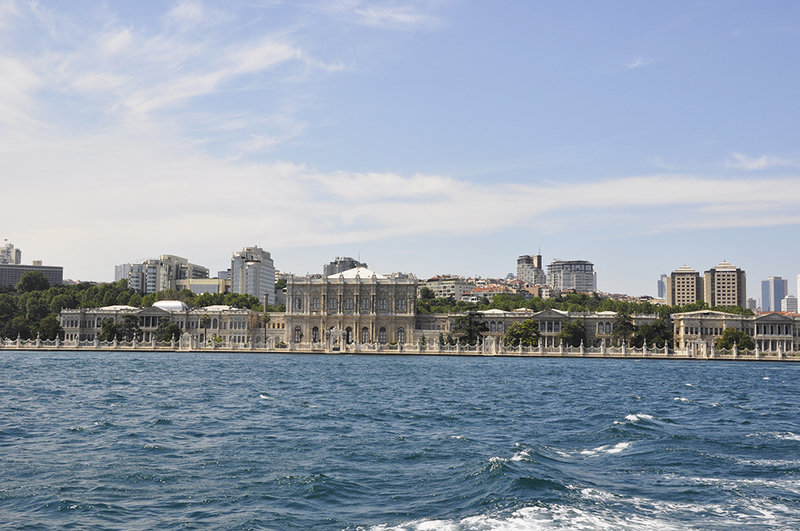 So, the ferry ride is pleasant, you’ve got nice views all around, and particularly of the Topkapi Palace, and later on a different ferry, the more modern Dolmabahce Palace in Besiktas. So, we arrive at Uskudar, and just miss the ferry to Besiktas. Argh. OK, should be another in like 10-15 mins, let’s just have a sit and wait. The kebap sammiches from the port vendors were really tempting, though. But no, I want to sit down and eat something proper at a cafe in Ortakoy. We’ll hop on the next ferry and be at Ortakoy in no time for lunch, I say reassuringly to my stomach. Ferry to Besiktas arrives. We choose to continue sitting and ignore it, as if it’s going to be docked there for another 20 minutes. Soon we notice people running to catch it, and figure maybe we should go, too. So, run over to the terminal, I shove my token in the slot for the gate to let me through; I am denied, and the token is spat back out. The boyfriend (already through) inexplicably reaches over and grabs the spat-out token, takes it and starts running for the ferry. I can’t get through to the ferry, I have no extra token. Like, dude, what about me! I literally yelled, entirely confused at this point. So, he runs back with the token, I shove it into a different gate and we just make the ferry by the skin of our teeth. All right, here we are in Besiktas! Only one more ferry to Ortakoy and food! So close. And yet so far, as I was soon to find out. We would find no ferry to Ortakoy here. We searched and asked and searched and asked some more, but no ferry was to be found. It was a supremely confusing situation; there should have been one there! But there wasn’t, so we walked the rest of the way to Ortakoy. It wasn’t too far, but it wasn’t too close, either. It was a nice walk, there were some pretty sights, but I’d rather have been on the ferry. Upon finally arriving in Ortakoy, which was a very nice little spot directly on the Bosphorus, I finally got my lunch (more kebap) and we also noticed that no ferries were arriving there. Not a clue as to why, but it made me feel a bit better to know that we hadn’t simply overlooked the Ortakoy ferry in Besiktas. Instead of walking back to Besiktas ferry terminal, we grabbed a taxi, and started the journey back to Karakoy via Uskudar. 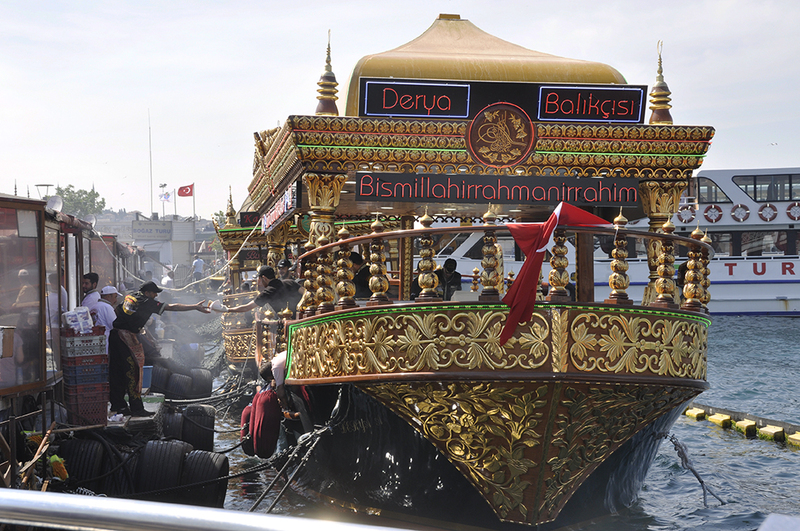 In Uskudar the trouble started again, when we confused Kadikoy with Karakoy and got on the wrong ferry. Because of course. So, all the way down to Kadikoy we go, but thankfully from there at least we don’t have to go back to Uskudar, and are able to hop on a ferry going to Eminonu and Karakoy. What an ordeal. The ferry rides were nice, but I had had enough and I’m not about to get on another ferry anytime soon (just kidding! I have to get on about a million ferries to get around the Cyclades in Greece in a month’s time). Mid-afternoon at this point, we made our way back to the general area of the hotel, and decided to stroll down the popular Istiklal Caddesi, a street lined with shops, hotels, cafes and bars. And it was rammed with people. 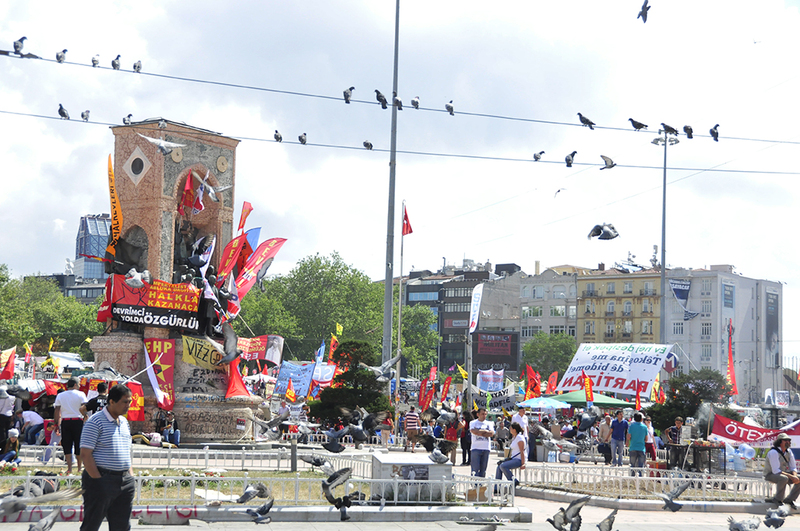 Apparently it’s always very busy, but the protests in nearby Taksim Square were attracting even more people. The nearer you got, the more filled the avenue became, and large groups of people were chanting unintelligible things. It was however, not an unsafe atmosphere, and there were loads of children running around in the Guy Fawkes mask. 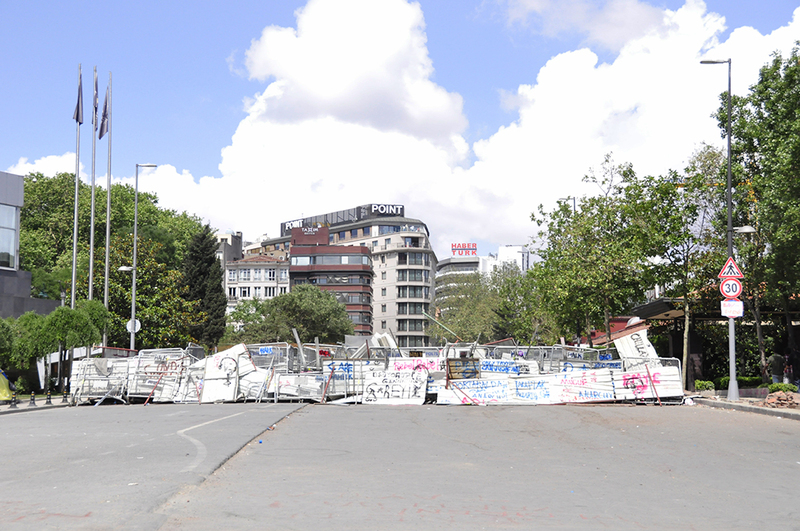 Once we got to Taksim Square, it was so full of people there was not much to do but turn back around. 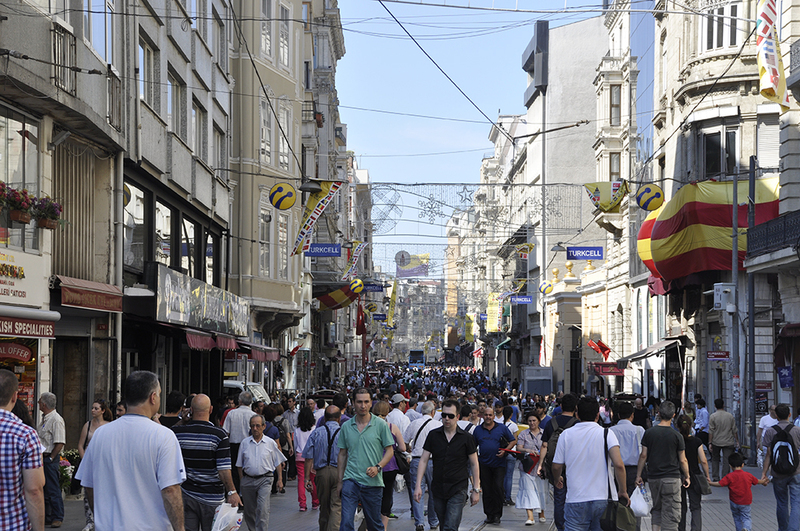 That evening we attempted another stroll down Istiklal only to find, not surprisingly, that it was probably twice as crowded with people as before. Wanting somewhere a bit more peaceful to relax for the evening, we retreated to a cute street we had noticed near our hotel, called Cezayir Sokagi. It was a steep, thin (pedestrian-only) street lined with grape vines and cafes and exactly the sort of thing I like to find when I’m traveling outside of Dubai, because it is so unlike anything I can find here. 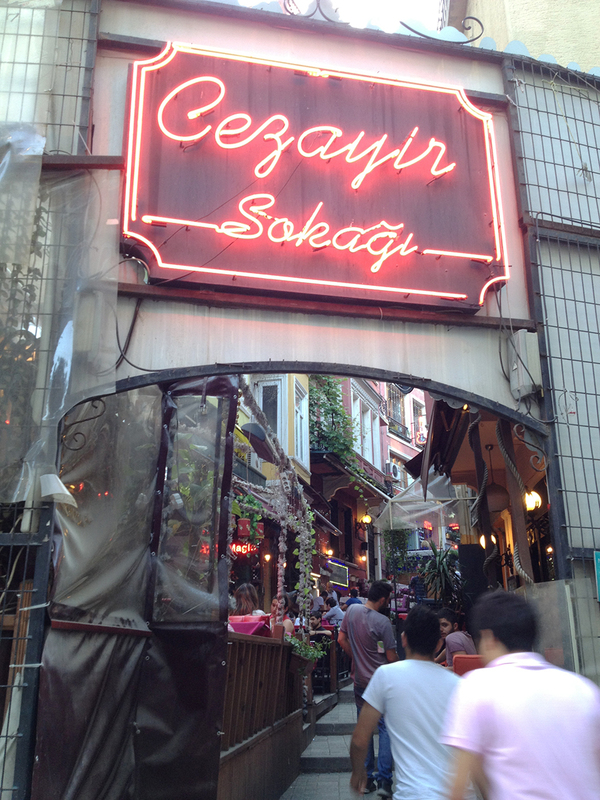 Grabbing a table outside, we considered our options for the evening supper, and decided on the nearby restaurant, Cezayir, which I had heard is very good. This, too, will be included with my coming hotel review, but I’m happy to repeat myself to say that the menu was delicious and the outdoor garden seating was perfect for an early summer evening. Portions were (overly?) generous, and the Cezayir kebap entree of beef tenderloin with sweetbread, and the traditional flour dessert were standout dishes. The previous day had been really, really long. My body finally decided to let me sleep in (until 8:00am!) but because it was our final day, and had to be at the airport that afternoon, we wasted little time getting out of the hotel to explore the neighborhood some more. 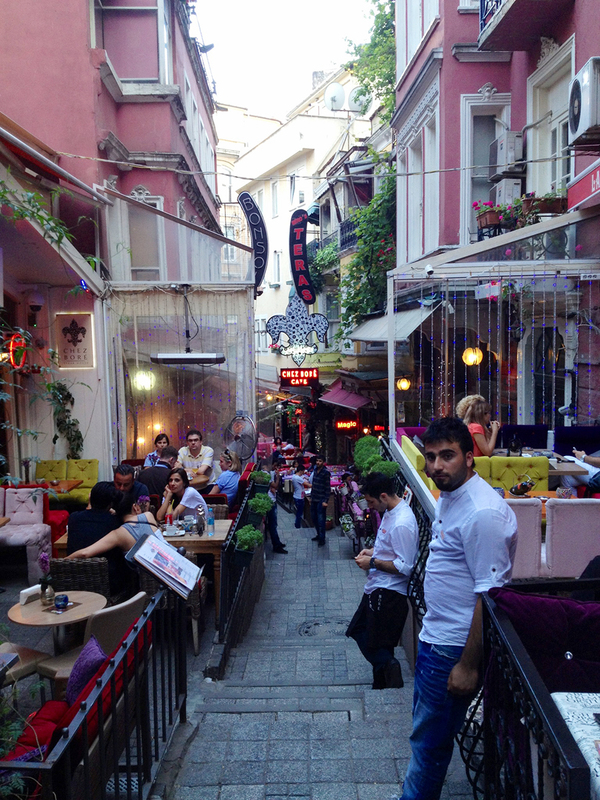 Istiklal Caddesi was mercifully quiet and it didn’t take long to make our way down to the Galata Tower. The tower was built in the 1300s, but was the only building I entered during our entire stay that actually had a lift. I was shocked, and had been fully expecting to have to force and whine myself up endless stairs to make my way to the top of it. But no, it was surprisingly modern inside. The top offered really fantastic views of Istanbul, as it was by far the tallest building in the general area. If you’re not afraid of heights (the walkway around the top of the tower is thin, sloped and there’s no solid wall) it’s definitely worth checking out for the views alone. And that’s all you’ll get really, because other than a touristy cafe inside the top of the tower, there’s nothing else you’re able to explore inside. With the neighborhood so empty (although with each passing hour it got considerably more crowded), we eventually made our way down to a much calmer Taksim Square. 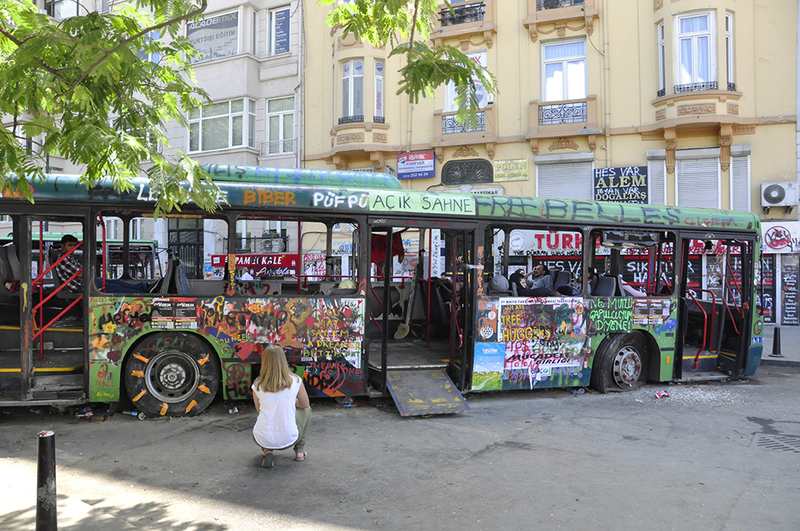 For the duration of our stay in Istanbul, there had been little to no police presence in Taksim and Gezi, so the atmosphere – from what I could see – was almost more festival-like than anything. There was lots of music (Pink Floyd, natch), vendors selling trinkets, people kicking the ball around with their dogs and lots of people happily climbing on and/or getting their photos taken next to blockades and graffiti’d buses (also posing as blockades). It was weird. The place was trashed though. Stores must have been making a mint from selling spray paint because everything was covered in it (and in support of every cause, not only saving Gezi Park or anti-government: anarchist symbols, gay rights, pro-feminism, legalizing marijuana). 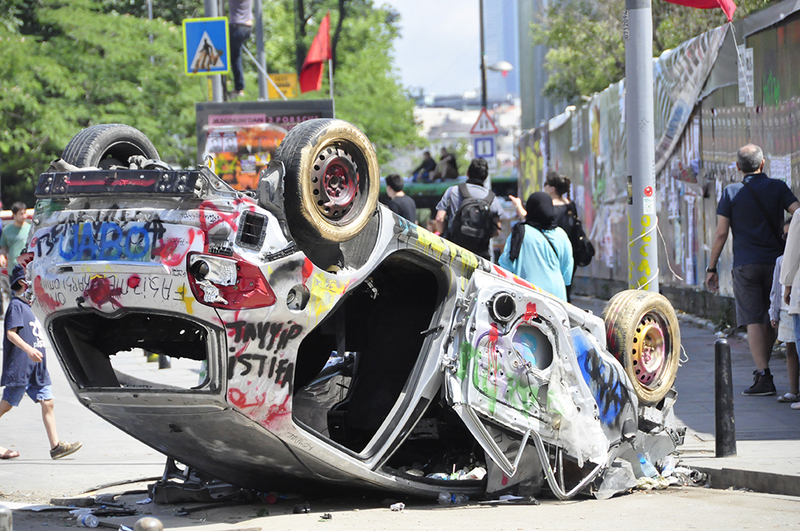 The buildings in the square as well as down through Istiklal Cadessi, the overturned cars, the buses, the makeshift blockades, the streets and sidewalks – everything was graffiti’d. Bricks and fencing had been ripped up to create and add to the blockades. I was already feeling bad for the people who would eventually have to clean it all up. I had also been wondering, hm, how/where are all of these people occupying the place going to the bathroom (I ask the important questions) and my answer was given to me in the lines of port-a-potties, which were utterly macabre. Their stench, it was difficult to get away from. It was interesting to be sure, and from a purely aesthetic point of view I enjoyed the look of the graffiti’d vehicles, but there was no reason to stick around (and it was getting more and more packed with people). The last few hours of the trip were much better spent at a comfortable and quiet table back in Cezayir Sokagi with wine, roasted vegetables and kebap. 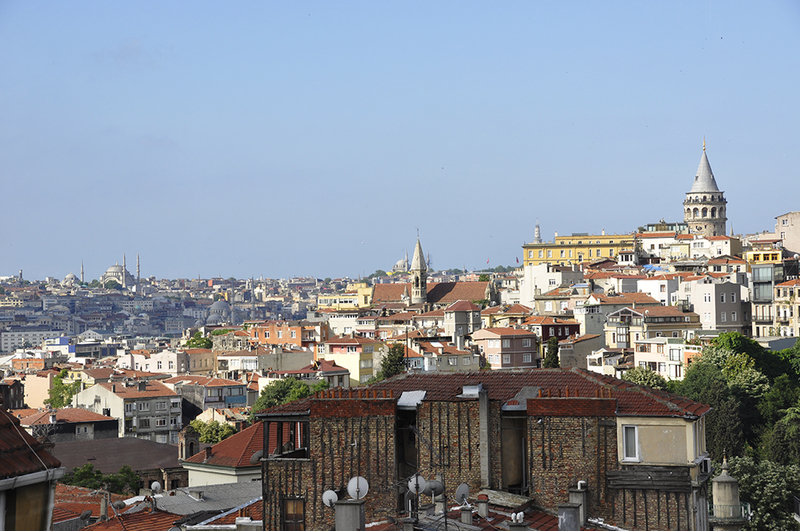 Missed Part 1, about Istanbul’s Sultanahmet neighborhood? Read it here.